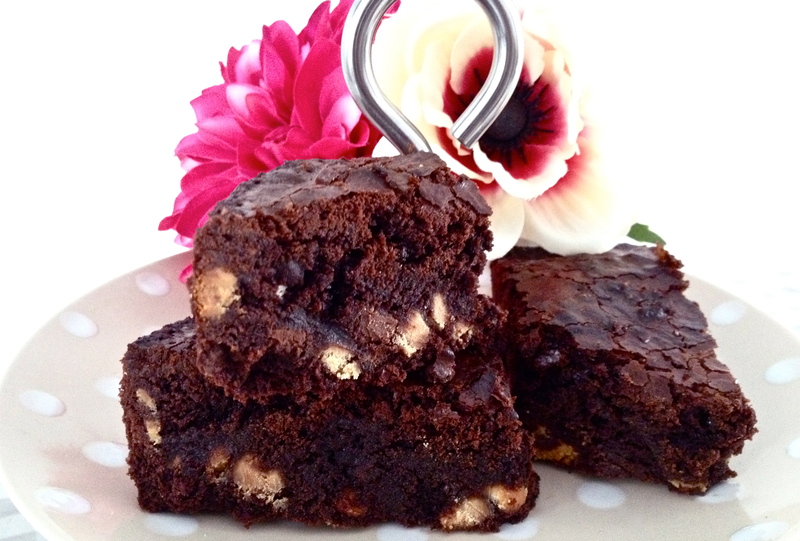 I have been looking for the perfect brownie recipe since I was born. Yes. It’s true. And I have finally found it. Last year I thought I found the best recipe ever, but after a couple of months I found a better one, and then another. Then yesterday I realized there was something missing in all of those recipes. One was very rich but not gooey enough. Another was gooey, but if it’s possible to say, they were too gooey. And some were just like cake. And if anyone’s had a real brownie, they should be offended by cake that is sold labeled as brownies. I mean, who are you trying to fool? So anyways, I combined all my brownie recipes and out came the Godzilla (the movie’s on right now!) of all brownie recipes! It’s really simple, and it’s just the right combination of chewy and moist, but it doesn’t fall apart when you try cutting perfect little squares, and it definitely doesn’t leave a trail of crumbs when you try sneaking one. Ok so here it is. The recipe. This recipe’s for a medium sized tray. I made them in a 8×8 inch cheesecake pan. Preheat your oven to 350 F. Grease your tin. For brownies I like using some baking paper or foil(baking paper is better), because they almost always stick. In a sauce pan melt the butter with the sugar on low heat. Make sure it doesn’t turn into caramel! Keep stirring for about 3 minutes. Take it off the heat and keep stirring so it cools down a bit. Then, using a whisk, mix in the cocoa powder, salt, baking powder, and vanilla. You don’t really need to add the extra salt because of the salted butter, but I think it really helps in balancing out the dark chocolate flavor. Add the eggs one at a time. Don’t over mix it. The baking powder ensures the brownies rise a bit, so be nice to the eggs! 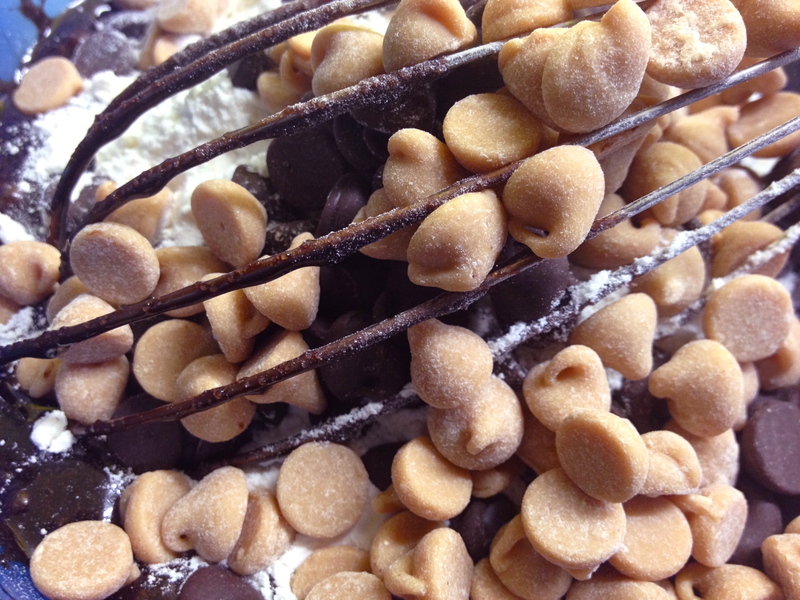 Then, with a spatula, not a whisk, fold in the chocolate chips and flour. You can actually mix the two in one bowl before them to the mix. If the chocolate chips are coated with flour, they don’t sink to the bottom or cluster in one area. This mix is pretty thick, but while it’s in the oven the chocolate chips can sink a bit. I was short on chocolate chips so I added in some peanut butter chips, which actually tasted really good. You can even add in white chocolate chips, m n m’s, etc. Pour the batter into the tin, and bake them for about 20-25 minutes. If you’re making a double batch add about 5 minutes to the baking time. The brownies should be set around the edges, and 90% cooked in the center. Kind of like a cheesecake. Take them out and let them cool for about 20 minutes before cutting them, if you can control yourself. They’re delicious just on their own, but some ice cream won’t do any harm!